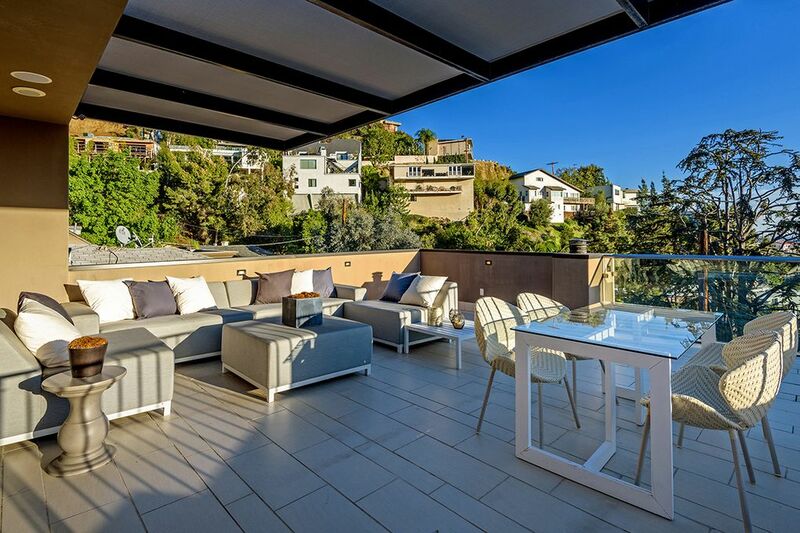 Dolph Lundgren has purchased a modern steel-and-glass home above the Sunset Strip in Hollywood. Dolph Lundgren is heading for the Hollywood Hills. The actor-director, who is set to appear in the December blockbuster “Aquaman,” has paid $3.9 million for a modern estate above the Sunset Strip. The steel-and-glass structure, originally listed for $4.4 million, offers city-lights views from three levels. Within its 5,230 square feet are four bedrooms and six bathrooms, including a sleek master suite with a private balcony. Wood finishes even out the whitewashed floor plan, coating the cabinetry in the kitchen, a wine closet in the dining room and a set of floating stairs. There are also a living room with a built-in fireplace, a game room, a theater, an office and a pair of two-car garages. Lundgren, 60, broke big in Hollywood as the machine-like Soviet boxer Ivan Drago in “Rocky IV” (1985), a role he’s set to reprise in the upcoming “Creed II.” The Swedish actor will also reprise his role as Gunner Jensen in the fourth installment of “The Expendables,” due out in 2020.